Editor’s note: This article is part of an ongoing series covering classical music and Iberian wine pairings by Burt Frink. To understand its origins, and why Burt felt a series was required on the subject, please read his first piece. His second piece covered classical music and chamber music. Classical music roots are in the human voice. Instrumentalists often refer to their choices of technique in terms of emulating the voice. To see this importance recall that the jazz vocalists often emulate musical instruments. Is this a chicken and egg argument? Maybe. To me it is a very real difference. So we continue into music and wine parings with the vocal recital. A strange choice you might think because this music is not instantly accessible. Often the language is other than your own and the performance style is highly mannered and stylized. Think ballet. If dance is like walking as I have too often been told then consider ballet and reconsider the notion. Dance is nothing like walking; dance is like dance. Classical voice is as equally mannered. And it is equally stylized. And so to is wine. At its expressive best great wine may not be immediately accessible. This is about difficult music with difficult wines. 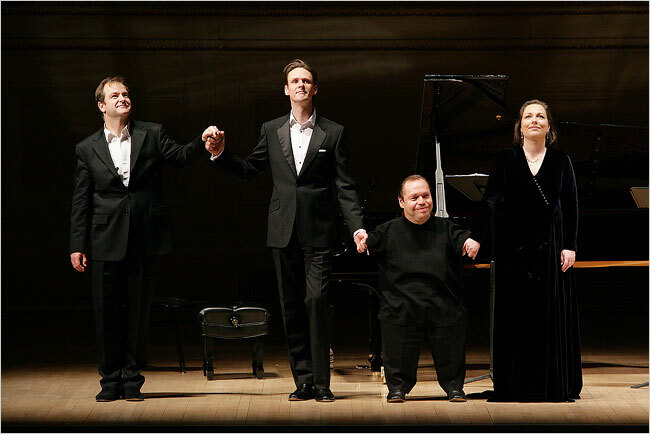 In his own words from his memoir The Voice, Quasthoff describes himself as a four-foot three-inch concert singer without knee joints, arms or upper thighs, with only four fingers on the right hand three on the left. He has a receding hairline, a blond pig head, and a few too many pounds around his hips, and he is in a superb mood. I cannot recommend his book enough if you are interested in appreciating the musical literature of lieder and art song as well as the demands on the singer to create their exquisite sound. To be sure his personal story is astounding; sometimes right out of Dickens in our modern times. But it is his sharing of the life of the musical artist not the celebrity that makes this book of significance. It sits on my music shelf next to soprano, Renee Fleming’s, The inner Voice: The Making of a Singer. Both books detail the study and analysis it took to create the most personal of musical instruments; ones own human voice. With more than six hundred songs in the oeuvre of Schubert alone you could spend a lifetime dwelling in this garden of musical poetry. With lieder, art song and aria recital I go to the wines of the late Al Brounstein and his Diamond Creek Vineyards . I have sampled his California Cabernets over three decades. They are pricey so it is not often. I want to concentrate when I get the opportunity and chatter from others won’t facilitate my experience. I want to be alone. People will just repeat the same impressions that have been written again and again. I suspect every serious wine drinker has a single bottle that eludes their palate. These are the wines that are generally agreed upon by critics to be products of exceptional breed. And yet personally they don’t touch you. Or perhaps a better phrase is you can’t reach them. So you go back again and again trying to see if you have changed in your impression. In my experience I always find his wines to be tight, closed and unapproachable no matter how much bottle age they have enjoyed. In a word they are difficult. So is German Leider. And both are great achievements worth the effort they require. Together they set my mind in exactly the place it needs to be. Nothing anyone is going to say is going to help in this personal journey. Privacy is essential. And Quasthoff is a great companion. Catavino Suggests: Find a wine that challenges your taste buds, your frame of mind, your routine. Allow yourself to step out of your norm and excite your senses. Whether that be a dry Fino from Jerez, a Brut Nature Cava or a even an Iberian wine made traditionally, with more subtle and elegant flavors. In a lineage of famous Welshman celebrated for their distinctive voices including the Poet Dylan Thomas and the actor Richard Burton we have the privilege today to live in a world with the irresistible Bryn Terfel Welshmen seemed to be beloved by women and admired by men and dripping with charm and masculinity. Terfel is a delightful actor and a wonderful recitalist. I had the joy of hearing him on stage for my second time two years ago. A full house called him back for the anticipated encores. After two songs he returned and sang the beautiful lullaby linked above. However, before performing his last selection he asked graciously that after this song the audience would refrain from applause and enjoy the quietness of the moment and make our way into the night and to our homes. On cue at the last phrase of the lullaby a house that had been standing and cheering minutes earlier fell to complete silence at his request and 1250 people moved out into the winter’s night in the afterglow of an evening with one of the world’s greatest classical music entertainers. In addition he is one of very few truly successful crossover artists. His Broadway albums are a joy not heard by my ears since the long ago days of the late Enzio Pinza. However, it is his Mozart, Handel, Rossini and song collections from the British Isles that enchant me. And the wine? Pinot Noir; a Burgundy if I can afford it otherwise one of the other Pinot options. He is the perfect companion for this wonderful grape. Every marvelous thing that is said about Pinot Noir can be enjoyed with this singer who seems to embody the alluring characteristics of the wine. Why not place this Spanish born world renowned superstar at the beginning of the list. As he is considered to be the greatest living tenor why not mention him first? Or perhaps last; the most honored place on the program? Because just a few weeks past I saw him on The Metropolitan Opera Live in HD in Verdi’s Simon Boccanegra performing the title role which is written for a baritone. Here was a great tenor singing baritone and at the top of his acting game as well. So I put him in the middle; both baritone and tenor. He has said that he will continue singing tenor roles and take on occasional baritone roles and we hope he will live forever. He is nothing short of remarkable. His discography has endless choices among them selections from Spanish Zarzuela which was the world of his parents performing careers. A conductor as well as a performer Domingo is an unmatchable companion for a outstanding bottle of wine. And that wine for me is an old Rioja. Both earthy and sophisticated the wine and the singer reach me with the gratification of serious reflection. 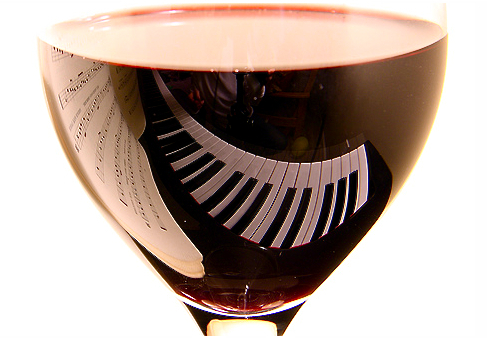 There are newer ideas and younger tenors but this is music and wine pairing that is quite difficult to equal. I can’t resist! You have to hear the man sing Tosca in the famous Zubin Mehta film set in the actual Roman settings of the opera. Catavino Suggests:As for which old Rioja? We tend to go for our old standbys such as wines from Lopez de Heredia. And now for something completely different! Mr. Bostridge is another great singer/actor with a style unlike either Domingo or Terfel. To be sure his voice is a tenor but that to me says little of the wonderful detail of his sound and performance. He can be light and he can be powerful. Like Quasthoff his fame is principally in the concert hall though his talent from time to time is found in opera casts. I fell under his spell when attending a concert of his featuring a night of Schubert songs. He was capable of creating an intangible informality of feeling that recreated a nineteenth century drawing room rather than a formal concert hall.Â He was not only singing; he was performing a character in a role without scenery or costume with such conviction that I was utterly taken into the experience. It was quite unlike the music video style of the opening link. He is a singer of great subtlety. The wine for me is a French Chablis. I am always pleased at its complexities created without convention. No obvious fruit; just minerals, stones and unique essences that bear contemplation. Are they better with extended bottle age? Where are the fine points in the various levels of classification? I don’t want to leave you with just the flamboyant side of Bostridge. Here is more of what you can expect in concert. This comes from the Gran Theatre del Liceu in Barcelona. Catavino Suggests: For Chablis in Spain, you need to be creative, though we might suggest Lopez de Heredia, but this time their 1989 white, which is both minerally and full of lush textures. I felt it would be a dodge to deal with the world of mannered and stylized music without consideration of the countertenor. The movie Farinelli created a broader exposure to this voice pitch and a renaissance in audience interest. However a fine documentary on the subject was produced that pointed out that the BeeGees were singing this pitch on disco recordings well before the film. In addition it seems there is some science behind the idea that women like men who sing in high registers. And for us jazz fans in Midwestern America the legendry Chicago jazz singer Jimmy Scott has long been a secret taste. Nonetheless this is a curious style with a history from a time long past. The music for countertenor is ornamental and outrageous. It requires an agile and acrobatic voice. This is not music to quiet the senses. It is quite the reverse. It is ostentatious performance that excites and provokes. Think for a minute. What is the most flamboyant wine you know? What do I drink with the Baroque countertenor? Stickies! These are exquisite wines that help consider the music. This is a union of matched obsessions. There is an obsessive quality about both someone who makes sweet wines and a man who sings as a countertenor. Let’s face it. Neither of these is an easy sell. These are perfectly good grapes that you could allow to ferment dry and bottle in a more conventional way. And these are not castrati; these are perfectly good tenors repurposed to a higher pitch. And that is done with no little effort. For winemaker and singer there are easier ways to make a living. An Israeli conductor goes for a walk on the beach and finds a closed bottle. He opens it and a genie comes out. He says, “You have freed me from this bottle after three hundred years. Now you can make a wish. The conductor thinks for a long time and then pulls a map out of his pocket, opening it up on the beach. Look here, this is Israel and here is Palestine, here Syria and there Egypt. For decades violence and conflict have reigned here. If you could manage to finally make peace I would be happy. The genie pensively rubs his chin “Hm, a very difficult assignment. I have only been out of the bottle for a minute or so and am still a little bit out of practice. Do you perhaps have another wish? The conductor thinks about it “I lead an orchestra and, like all conductors, I have a problem with the viola players. They are always late, demand the most breaks and the highest pay, but cannot play their instrument correctly. If that could stop I would be grateful. The genie scratches his chin and says “Better show me that map again. Catavino Suggests: Old Madeira, fine port or a our personal favorite, old Setúbal. A wine from Moscatel can convert any wine drinker into a sweet wine addict! Next posting I promise something easy. We will look at the piano concerto (read here); 106 musicians with a showoff soloist in front of them. This is some of the most accessible music in the classical canon.